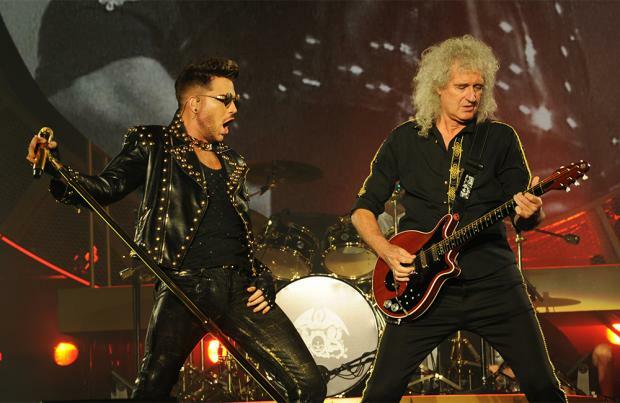 Queen + Adam Lambert are set to star in a new documentary. The 'Bohemian Rhapsody' hitmakers and the 'American Idol' star – who joined forces with Queen back in 2011, filling in for late vocalist Freddie Mercury – embarked on a successful worldwide tour from 2014 to 2018, and that journey is now set to be documented in film in a new two-hour documentary called 'The Show Must Go On'. Adam tweeted on Monday (25.02.19): "So excited about our documentary "The Show Must Go On – The Queen + Adam Lambert Story" airing on @ABCNetwork on April 29th!! @QueenWillRock (sic)"
The announcement comes after the group recently performed at the Oscars, and Adam also took to social media to praise Queen members Brian May and Roger Taylor as "legends". In another tweet, he wrote: "Truly an honor to continue performing alongside these two legends after 7 years. You've changed my life! Im honored to help keep your songs exist as live entertainment! I love u Freddie! @DrBrianMay @OfficialRMT @QueenWillRock (sic)"
The documentary is set to air on ABC in April, and will feature behind-the-scenes concert footage dating back to their first shows in 2011, as well as a string of interviews with Brian, Roger, and Rami Malek, who won the Best Actor Oscar over the weekend for his portrayal of Freddie Mercury in the 'Bohemian Rhapsody' biopic. Meanwhile, Adam recently revealed that while speaking with the band, they allegedly told him that they believe that if Freddie was still alive, the two of them would have gotten on well. They were apparently recalling to Adam about how Freddie had a "dry" sense of humour, and would sometimes pull pranks backstage while on tour, and told him that if the duo had been able to meet, they would have gotten "a kick" out of each other.